It’s one of those places on our list of destinations for a brief and recharging retreat whenever we want a temporary respite from the hustle and bustle of city life. Three hours from Metro Manila might not seem like a short ride away but that’s how long it takes to navigate the 100 km. distance with the present state of vehicular traffic in the metropolis and surrounding provinces. For the moment though it’s something we’re willing to put up with. Display of footwear products at one of the many stalls at Liliw’s Gat Tayaw St. Early 20th century house along Gat Tayaw St.
We normally prefer a natural destination even for short trips outside the city. However we ended up not visiting any of the cold springs in Liliw, settling instead for the tourist spots in town. Somehow there is something in the town’s character that draws us in like a magnet. Part of that must probably be the early 20th century houses along Gat Tayaw St. and the surrounding thoroughfares. These residences are in various stages of preservation; some have converted their ground floors into tsinelas shops or restaurants, probably to help put up with maintenance expenses which could be quite prohibitive. Restored ancestral house along Gat Tayaw Street. 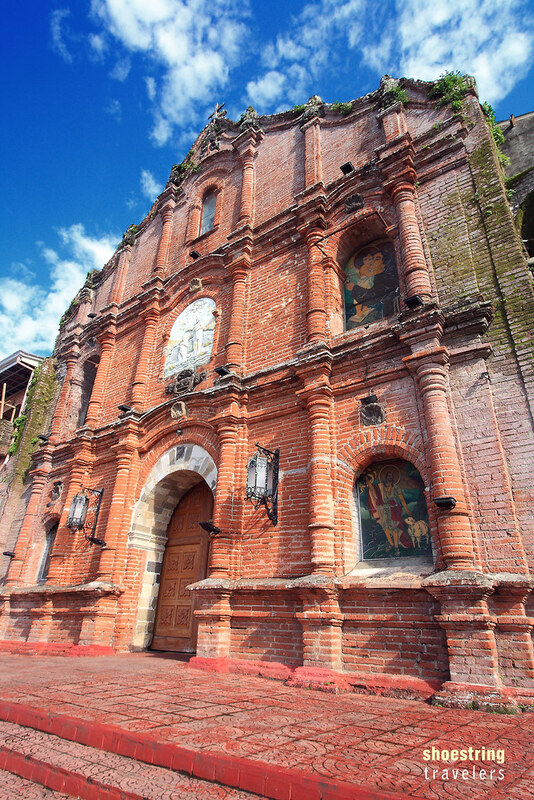 Probably the most interesting structure in Liliw, however, is the red brick San Juan Bautista (St. John the Baptist) Church building. Situated on a rise of ground at the end of Gat Tayaw St., this church is within easy walking distance from the tsinelas shops. First built as a wooden structure in 1620, it was partially destroyed during the Great Luzon Earthquake of 1880, reconstructed, and then damaged again by fire in 1898. 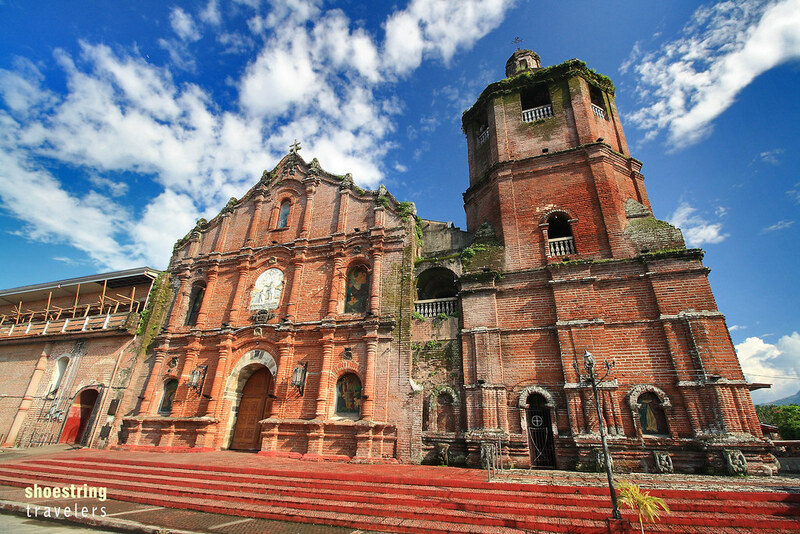 Its baroque-inspired red brick architecture makes it the most impressive and beautiful church in the province of Laguna in our opinion. The San Juan Bautista Church building. A closer look at the church facade and its red brick composition. There are actually several natural destinations within a few kilometers of Liliw such as Mahayhay’s Taytay Falls, Bunga Falls in Nagcarlan and mountain springs in both towns. Every time we’ve made visits to these spots however, we would always drop by Liliw for lunch or a quick fix. Liliw has two of the better restaurants in Laguna – Chef Mau Restaurant and Arabela Italian Restaurant, making it an obligatory stop on our travels to this side of the province. Chef Mau’s rendition of paco (fiddlehead fern) salad; there’s a lot of these ferns being sold in town. Chef Mau serves up a number of Filipino dishes on its menu. The restaurant is located in Barangay Bungkol, not too far from the town center and on the main road going to Magdalena town. Its founder and owner – Chef Mauro Arjona, Jr. is a Liliw native and award-winning executive chef who co-owned and operated 18 restaurants at different times. His is an inspiring story of a tsinelas-making employee, who subsequently became a dishwasher in a restaurant before moving on and becoming a chef and restaurant owner in Metro Manila. We were intrigued to discover an Italian restaurant in a relatively remote destination this side of Laguna a few years ago but Arabela Italian Restaurant serves Italian dishes that are quite close to the real thing. Their eggplant parmigiana is the best we’ve ever sampled. If you’ve already taken lunch elsewhere, Arabela is a nice place to just sit around and enjoy coffee with your choice of sumptuous desserts. Their vintage-style interior with artworks adorning the walls makes for a cozy setting but beware the low headroom. The restaurant is set on the ground floor of a renovated century-old structure. Filipino colonial structures normally use the ground floor as a storage room, thus the low headroom. It seems forever but we promised ourselves that next time we visit or drop by Liliw we would make sure to visit the cold mountain springs that initially made the town famous. That’s if we do not get happily sidetracked again by the numerous attractions in town. Posted in LagunaTagged calabarzon, Food Trip, Laguna, Liliw, outdoors, restaurants, Southern Luzon, travelBookmark the permalink.